It may have had its flaws (what was up with that teleprompter? ), but Sunday night's 2014 Golden Globe Awards succeeded in reminding us why awards season is the best time of year. Between the dozens of celebrities, the GIF-worthy moments, and the honoring of films and TV shows that actually deserved the recognition, this year's Globes was everything awards shows are supposed to be. Honors: The best in movies, including young actors, ensembles, and genres. 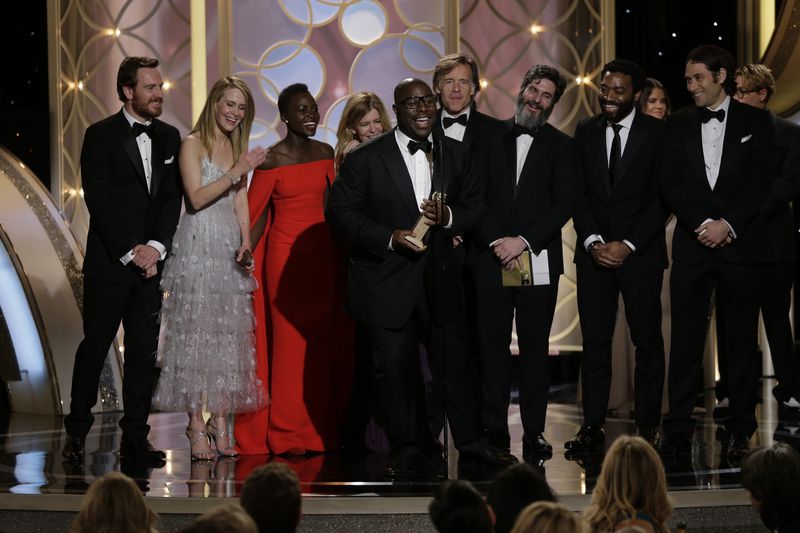 What to Expect: A less prestigious Oscars, underdogs like Short Term 12's Brie Larson and Enough Said's James Gandolfini getting a shot, Gwyneth Paltrow possibly accepting an award for Iron Man 3. Worth Watching? If you have the time. Some great films are going to be honored, but then again, any awards show that puts Gravity's Sandra Bullock in the same category as The Hobbit's Evangeline Lily is probably not to be taken too seriously. Honors: Acting in film and TV. What to Expect: Movie and TV folks mingling, American Hustle winning all the awards. Worth Watching? Probably. Sure, they're a bit repetitive, but the SAG Awards always bring the fun. And this might just happen again. Honors: The best in music. What to Expect: A lot. Twerking, trapezing, a duet between Stevie Wonder and Daft Punk — it's all fair game at the Grammys. Worth Watching? Hell yes. The Grammys may get frustrating at times (seriously, no Justin Timberlake for Album of the Year? ), but they're rarely boring. Performances from Lorde, Pharrell, and even Metallica will keep this year's ceremony interesting. Honors: British films/movies shown in the U.K.
What to Expect: A Philomena takeover, lots of British humor. Worth Watching? Unless you live in England, you can't. Still, it might be worth catching up on the winners list later in the night, because the BAFTAs have a good history of predicting Oscar honorees. What to Expect: Casually-dressed celebrities, whiskey-drinking presenters, some well-deserving actors (Brie Larson, Michael B. Jordan, Shailene Woodley...) finally getting notice. Worth Watching? Definitely. The Indie Spirits, held the night before the Oscars, give recognition to movies that truly deserve it. It's a fun, light-hearted ceremony, and this year's host is the hilarious Patton Oswalt. Honors: The worst movies of the year. What to Expect: Crappy jokes, a lot of hate for Grown Ups 2, the possible appearance of an A-list celebrity accepting his/her award in person. Worth Watching? Ehh, probably not. Adam Sandler winning award after award gets old fast. Still, if you must, the show can be streamed on Youtube. Honors: The very best in film. What to Expect: Sober stars, long speeches, pre-rehearsed tears. The Oscars are much more boring than you remember. Worth Watching? Of course. Yeah, the Oscars may be predictable, but that doesn't mean they're not worth tuning in to see — it is the biggest night in Hollywood, after all. Besides, with Ellen DeGeneres hosting, this year's show should be better than most.